Discover more than 150 high-quality applications and games for your Symbian phone. Browse in the AppList client with the familiar Nokia Store user interface! AppList for Symbian comes with a homescreen widget with that you will not miss any app update in the future! Additionally find informations about new apps! Looking for an AMOLED-friendly UI? 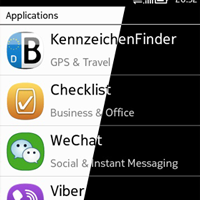 AppList provides a White and a Black theme you can select from for the best user experience on your smartphone! Nokia is a registered trademark of Nokia Corporation. Symbian is a trademark of Symbian Software Ltd. AppList, the AppList application and the AppList project are not associated in any way with Nokia Corporation or Symbian Software Ltd.